The heads of 27 space agencies from countries all over theworld ?met today (Nov. 17) at a summit in Washington to discuss the future ofspace exploration. NASA administrator CharlieBolden was among the speakers at the Heads of Space Agencies Summit, organizedin honor of the 50th anniversary of the International Academy of Astronautics,a group that aims to foster the development of astronautics for peacefulpurposes. The summit brought the agency leaders together to discuss internationalcooperation in four areas: human spaceflight, robotic space exploration,climate change and disaster management. 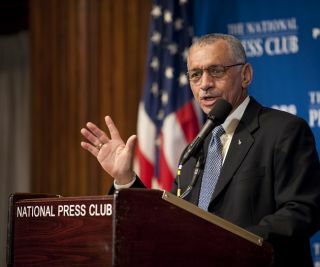 After the event, Bolden noted that the space agencies are concernedby "issues almost all countries are grappling with, such as changingnational priorities and stagnant budgets. NASA has been actively working withmany of the space agencies attending the summit to further our commonunderstanding of exploration and establish global partnerships." Other notable speakers were Abdul A.P.J. Kalam, the former presidentof India; Leonid ?Kuchma, the former president of Ukraine; and Dumitru-DorinPrunariu, chairman of the United Nations' Committee on the Peaceful Uses ofOuter Space. "NASA recognizes that exploration beyond low-Earthorbit will involve the coordination, cooperation and support of othercountries," Bolden said. "I can assure you that as we look to thefuture,international cooperation will continue to be a cornerstone of NASA'sexploration activities." Five major space agencies ? from the United States, Russia,Europe, Japan and Canada ? have worked ?together to build the $100 billionInternational Space Station. The station is the product of cooperation among 15different countries in all.Astronauts and cosmonauts have been flying missionsto it for just over 10 years during its construction, which began in 1998 andis due to be completed in 2011.